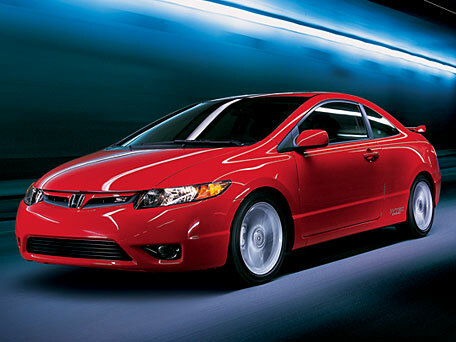 San Francisco: The Honda Civic remains one of the most popular cars in America. Folks love Civics for their rock solid reliability, and many serve commute duty. But if you want one of the most exciting popular cars in the U.S., you need to check out the Si model. For two decades, the Si has been the Civic with muscle, and this newest iteration is the best one yet. By the way, that's pronounced S-I, not like your Uncle Sylvester's nickname or the Spanish word for yes. I owned a brand new Civic Si back in 1986. It was white with blacked-out trim, no chrome. Chrome was not appropriate for sporty cars back then. And what did sporty mean two decades ago? Well, my little hatchback had a tail end as flat and upright as a garage door, and it was all glass. With some resemblance to the original 1970's Civic, but with extended and edgier lines, this little rocket packed 91 horsepower and sported three valves per cylinder. That sounds laughable today, but remember two things, it cost less than $9,000 including tax and destination charges and 91 horsepower was about 50 percent more than the standard Civic enjoyed. Since then, the Civic, including the Si, has matured greatly and has grown so much that Honda decided to import the smaller Fit hatchback under it in the lineup. The 2006 Civic shares an all-new, larger design with other Civic coupes. No longer a hatchback, it now packs 197 eager horses under its snubby hood. This i-VTEC four-cylinder powerplant is transversely mounted, as always, and works through a new six-speed manual, the only gearbox available with an Si. With just 139 lb.-ft. of torque available (at 6200 rpm), the 7800 rpm redline does wonders for moving the Si along briskly. Road & Track magazine got a 6.6-second zero-to-sixty time out of their test car. The Honda engineers have tuned the exhaust for a threatening snarl when you push the revs up. Fuel economy is rated at 23 City, 32 Highway, great for a performance car. Your mileage may vary, a lot, depending on how much fun you have. My Habanero Red Pearl test car made a very strong impression on the road, especially to a couple of guys in an Acura Integra, who nodded at me knowingly and admiringly. The exterior styling on all Hondas is ultramodern and slightly radical. The Advanced Personal Compact design theme uses a One-Motion Form, according to Honda's helpful media relations staff. What this means in layman's terms is there is no sharp division between the hood, window greenhouse, and trunk. This aerodynamic design is surely a precursor of cars in the second decade of the 21st century. The coupe and sedan actually share no sheetmetal, and have different proportions appropriate to their purposes in life. That 21.9 degree raked windshield is even slicker than the one on the Si's exotic corporate cousin, the Acura NSX. It takes some getting used to. Honda's savvy designers have created a split dashboard, so the essential information, such as the digital speed readout and analog fuel gauge, is tucked up by the windshield base, and the lesser controls find a home through the steering wheel, the normal placement in most cars. The dash layout is quite swoopy, and with colorful gauge illumination, it gives a bit of an arcade feeling. That's good, because many Si aficionados are sure to know that environment intimately. The Civic Si gets an exclusive rear wing, lower body aero cladding, and Si badging. Seventeen-inch alloy wheels with low profile tires are standard. The interior benefits from deeply bolstered seats with red stitching and exclusive trim panels. My Si provided a nice 350-watt premium sound system with seven speakers and a subwoofer, as well as an MP3 jack, these Honda folks know their customers. There's leather on the wheel and the metal shift knob, but not on the seats. This is an affordable pocket rocket, remember? Most Civics for American consumption are made in North America; the Hybrids are built in Japan, for now at least. My tester was produced in Alliston, Ontario, Canada, with 70 percent content from the U.S. and Canada, including the engine. So tell me, what exactly is an imported car these days?